Traditionally data centers were built with raised floors and ran power feeds from PDU's and RPP's to the computer equipment using the air space under the floor. An increasing number of data centers are being built on slabs or choosing to run both power and network cables overhead. 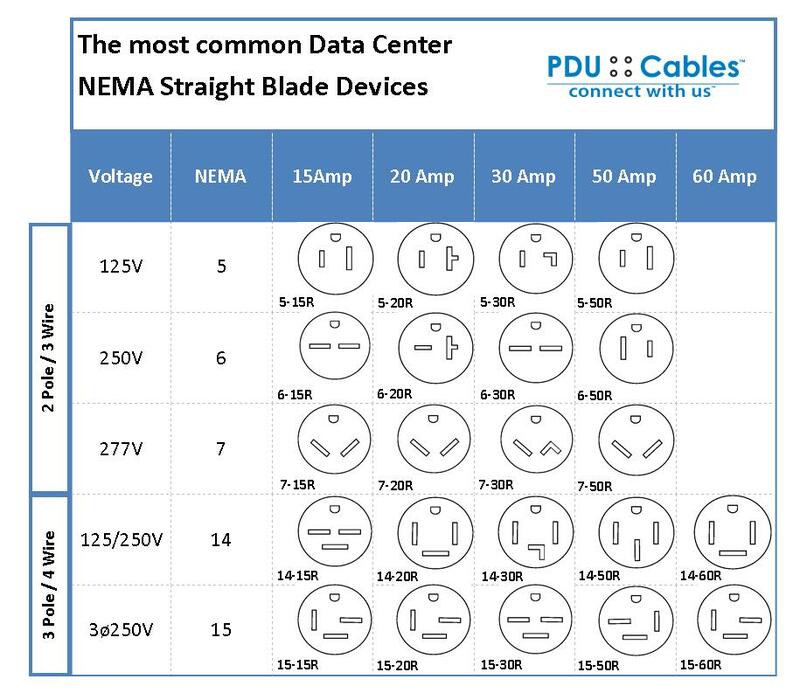 PDU Cables branch circuit power distribution cables are being installed in data centers everyday in overhead cabling applications. Run in overhead ladder racks and cable trays, with the addition of factory installed hardware, mounting to ladder racks and cable tray is fast and easy. PDU Cables custom labeling options also makes for easier identification of panels source and power paths even from an overhead position. The NEMA (National Electrical Manufacturers Association) pattern and numbering system is made up of four main identifiers. The first identifier can be a blank space or have the letter L. This determines whether it is a straight or locking blade device. The second identifier is a number. The first number in a NEMA listing determines the voltage rating. The third identifier is a number and identifies the amperage rating of the device. The fourth identifier is a letter. 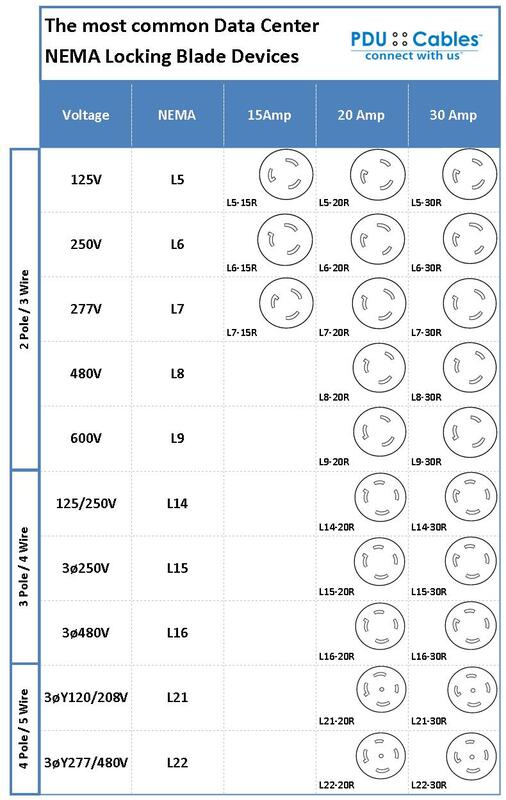 This identifier determines whether the device is a plug, P, or a receptacle/outlet, R.
RussellStoll® receptacles (IBM type) are available in box style or in-line connector versions. The housings are corrosion resistant and cast aluminum manufactured. The receptacles are watertight, arc-resistant and constructed with a molded plastic interior. IEC receptacles are Pin and Sleeve style, watertight, made with rugged nylon housings and color coded by amperage. The shrouding on the IEC devices protects the pins from abuse and are arc-resistant. *Available with isolated ground. All NEMA Type cable assemblies are available in daisy-chain configurations. SO Cord assemblies with male plugs and/or female connectors.